There are some works of art that define a person. Things that go beyond just being entertainment, or something to do when you are bored, and become a part of who you are. For me, Monkey Island is one of those things. When I was about eleven years old, my Dad had just bought a brand new computer and with it he bought some games for me to play. He found all the games in the bargain bin at the store for $5 each. Most of them were worth their $5 price tag, but there was one single (non cursed) diamond among the rough, that would grab a hold of my soul, like a wire to a chicken with a pulley in the middle. That game was The Secret of Monkey Island. After that initial fix, I was addicted for life, and whenever any mention of monkey or island were in the same sentence I immediately perked up. Then the dark days came. 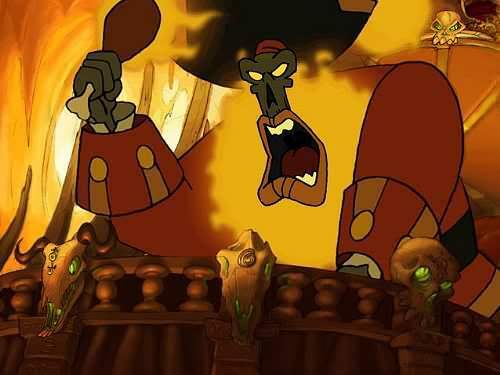 Much more of a villain to Monkey Island fans than LeChuck himself. At E3 one year, when asked about the future of Monkey Island he infamously said (I'll paraphrase) that LucasArts wasn't interested in old properties, and wanted to move forward with new ideas... like Star Wars and Indiana Jones. Around the world it sounded as if as if thousands of Monkey Island fans suddenly cried out in terror and were suddenly silenced. Even though we were promised at least one more Monkey Island game, with a single sentence, all hopes were dashed. For years we all wandered around aimlessly like zombie pirates drunk on Grog, until that glorious day happened, Jim Ward left for "personal reasons". Though I like to believe it had something to do with being constantly sprayed with Root Beer every day after work (only way to kill the undead, you know). 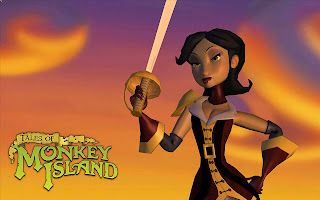 After about three changes in power at LucasArts, they finally got their collective head out of their arse and brought back Monkey Island in a big way. First, they remade the original game, but more importantly, they gave all new iterations in the series to Telltale Games, a breakaway game company comprised of LucasArts Adventure Game veterans. And if that wasn't enough, the original creator of Monkey Island, Ron Gilbert signed on to point and click the team down the right path. The first part of their venture was Tales of Monkey Island. A five part tale of Guybrush Threepwood and company on another high seas adventure to once again finally put a stop to LeChuck for a fifth... and sixth time. Last week I finally got around to finishing the games. Now you are probably saying, "Wait I thought Monkey Island defined your soul! The games are over a year old, and you are just now playing them?" I tried playing them when they came out... on the Wii. This was a huge mistake. I made it through the first two episodes and then realized I couldn't do it anymore. In order to fit in Nintendo's download standards the games had to be horribly horribly compressed. The dialogue is almost impossible to understand. The SFX sound like they are coming through a Gameboy speaker, and the graphics look like something the N64 pooped out. I understood this was more Nintendo's fault than Telltale, but it put a bad enough taste in my mouth to not get the third part in the series. But finally it was released on PS3, and all was right worth the world. Better yet, the entire five part series was only $20, meaning I saved $10 if I had gotten the rest of the series on Wii. The PS3 version isn't without it's issues sadly, as it is kind of wobbly with the controls, and using the Wii remote to point at object was 100% better than cycling through them with the PS3 controller. Regardless, all the brilliant writing and puzzles come through magnificently. And with Monkey Island that is what matters. The weak link in the MI series is Escape from Monkey Island. It was the series leap into 3D. It wasn't a bad game, but not nearly as memorable as the other three. So with Tales being in 3D I was slightly apprehensive. However, this series stands tall among the original trilogy in my mind. The jokes don't fall flat, and the wit and puzzles are in top form here. Also what matter in a Monkey Island game are great side characters. In Secret you had Elaine, LeChuck, the Voodoo Lady and Stan, all four now mainstays in the franchise. In Monkey Island II, Wally was introduced, a reoccurring character. 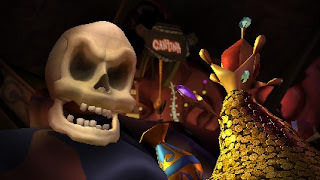 In Curse, my all time favorite character Murray the Demonic Talking Skull was introduced. I can't really recall a single memorable character from Escape, and I think that is part of its problem. In Tales, I can't really say how many of these characters will stay with me in the long run. Sure there are some forgettable ones, but they all have quirky traits and personalities. But I can say there are at least two stand out successes: Morgan LeFlay and DeSinge. DeSinge is fantastic, in that he is the first real main villain the series has ever seen outside of LeChuck. And on top of that he is very much the Anti-LeChuck, but he works. He is an effeminate powder wig wearing Frenchman. Every time he is on the screen, he is like the embodiment of a train wreck. Everything about him is just so wrong, but you can't look away. The real star of the show, however, is Morgan LeFlay, a pirate hunter sent to capture Guybrush Threepwood, but also happens to be Guybrush's biggest (only?) fan. This leads her to live a very conflicted lifestyle. I absolutely love this character. 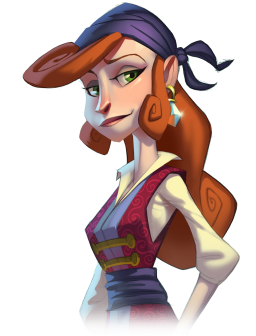 I wish Telltale would make a spinoff action adventure game with just her going around the world of Monkey Island capturing famous pirates. Her existence also adds something rather unexpected to the Monkey Island universe: drama. There are a couple of love triangles in this story. 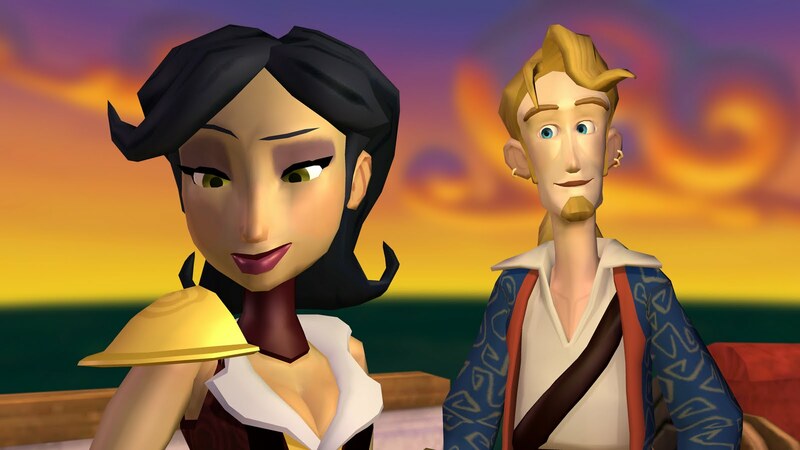 LeChuck-Elaine-Guybrush and LeFlay-Guybrush-Elaine. Luckily, none of it gets melodramatic. There are just a few scenes that are slightly more emotionally touching than the series is used to getting, which I am all for. Another problem with Curse of Monkey Island was that it was a little too self-aware. You just felt none of the characters were going anywhere. They had just become parodies of themselves. 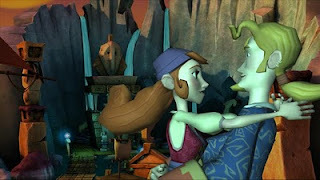 Which brings me to what I like the best about Tales of Monkey Island. Ultimately, Tales is the natural progression of the Monkey Island franchise in that now, finally, the series feels like it has its own, living breathing world. With all the anachronisms, and references to modern society, it was always hard to tell where and when the Monkey Island adventures took place in history. Telltale has made it seem as though this is some kind of alternate universe where the world is forever ruled by pirating. It's it's own place in time with its own history. And I like that. It makes it feel more real and less of a joke, or a statement about society (which is where Curse of Monkey Island was going). Great job Telltale Games, you have made the 11 year old inside of me very happy, as well as the 29 year old... outside of me.